The first step in algorithmic strategy design usually is to find some indicators which give you an edge and tell you something about tomorrow’s market behaviour. You could use a lot of statistics to describe this edge, but I like to take a graphical approach in indicator testing first, and only later on worry about the maths and statistics. A scatter chart is a simple to read chart style to see the correlation between two input values. A regression line on the scatter chart gives you a visual idea if the two securities are positively or negatively correlated, the “cloud structure” of the scatter points tell you if this correlation is tight or loose. This sample scatter shows the correlation between the DAX and DOW levels, and it can be easily seen that these two markets are tightly correlated in a positively way. The horizontal scale is used for the second security (DAX), the vertical scale is used for the first security (DOW). This chart type is predefined in Tradesignal, just drag&drop it onto the securities on the chart and select the right amount of data to get the analysis you want to see. (eg. 2000-now). 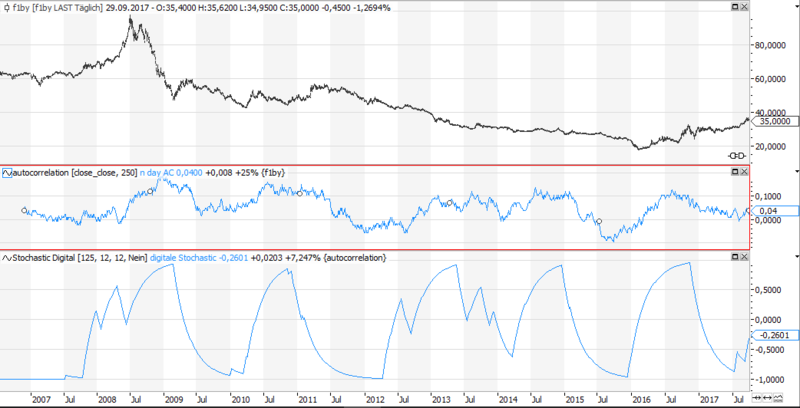 If you see a tight and positive correlation like on the chart above, It might be used to select the instrument you want to trade. If market A is easier to predict than market B, select A. 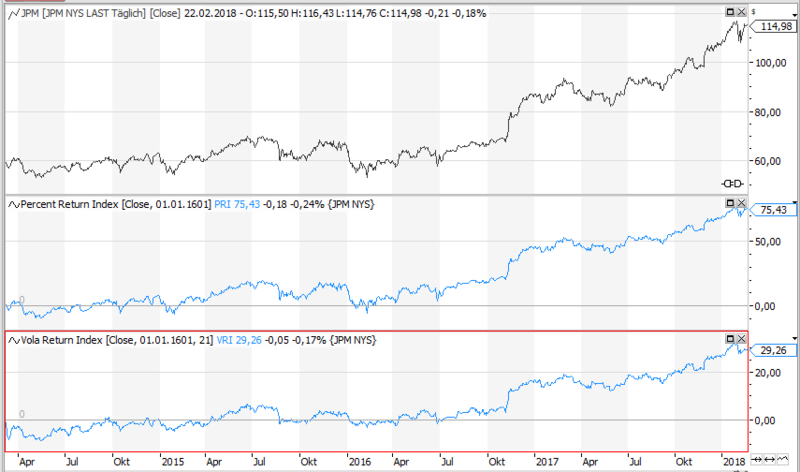 Although a scatter chart is usually used to show the correlation between two markets, it can also be used to show the correlation between two indicators. 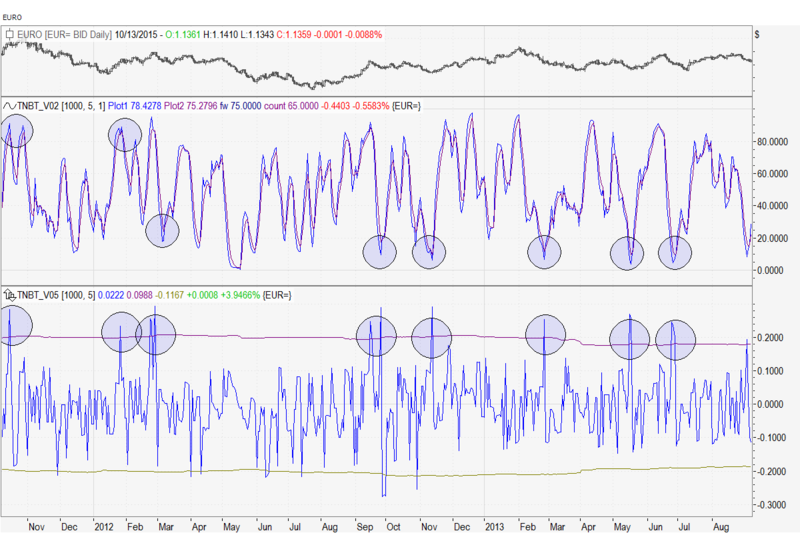 The chart above shows the correlation between digital stochastic and momentum. 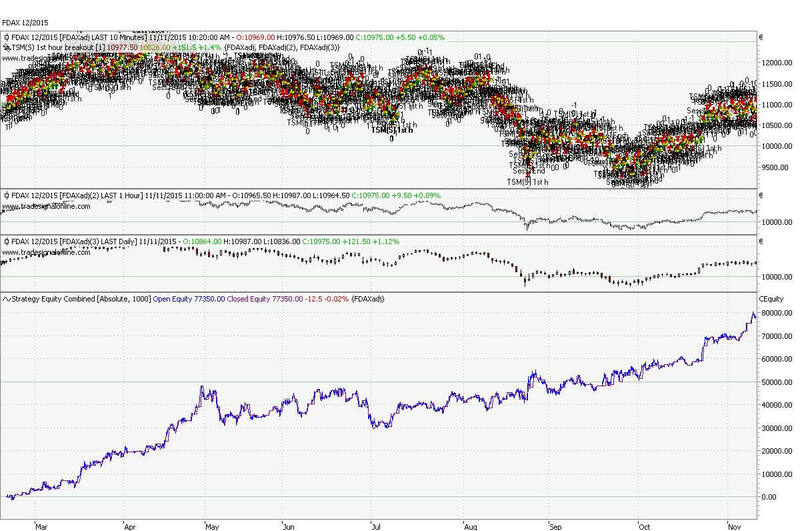 Have a look at the clustering of points in on the right side of the scatter, a high level in digital stochastic usually goes with a high momentum. 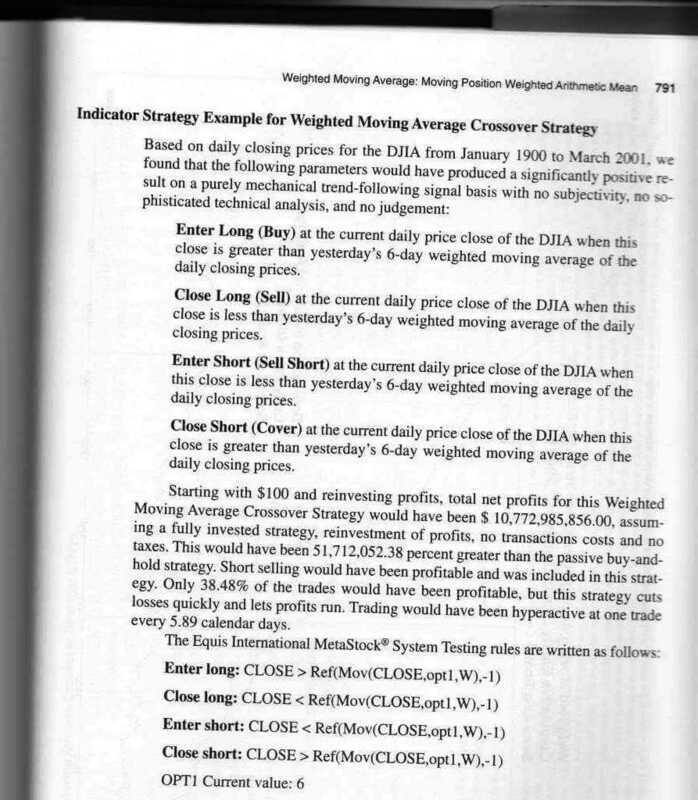 This insight enables you to get rid of momentum, as digital stochastic is easier to read than the shaky momentum. Less indicators = less parameters = less curve fitting. 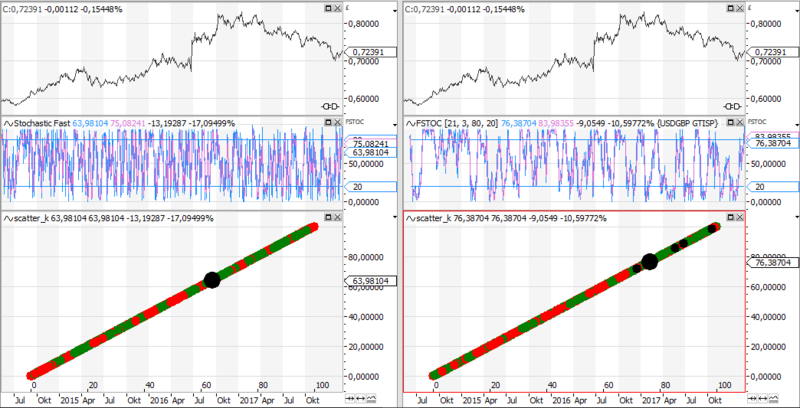 Doing this analysis and getting rid of parameters is great if you want to minimise the dangers of curve fitting, but it does not tell you if your indicator is of any use at all, when it come to describing tomorrows move of the market. 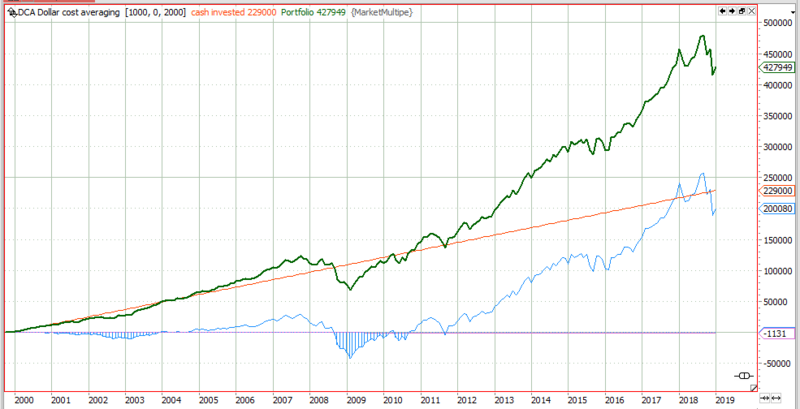 Surely it is valuable insight that a high level of stochastics corresponds to a high momentum, but does a high momentum today also mean that the market will move up tomorrow? And this question about tomorrow is the key question I ask myself when searching for some edge. To get a glimpse on the prognosis quality of an indicator we will have to add some colour to our scatter chart. This colour tells me what the market has done after a specific indicator level has been reached. Green for an up move, red for a down move, black for not decided by now. This chart shows the prognosis quality of the stochastic indicator. The left chart shows the 1 day prognosis of a 5 day stochastic, the right chart gives you the 5 day prognosis of a 21 day stochastic. Observe the clustering of the red and green dots. (black for not decided by now) As you can see on the left chart, the one day prognosis using a 5 day stochastic is not the thing to do. Regardless if stochastic is high or low, you get a nice mixture of red and green dots. This means the market, at a given stochastic level, sometimes moved up, sometimes moved down. Not this behaviour is not very useful for trading. 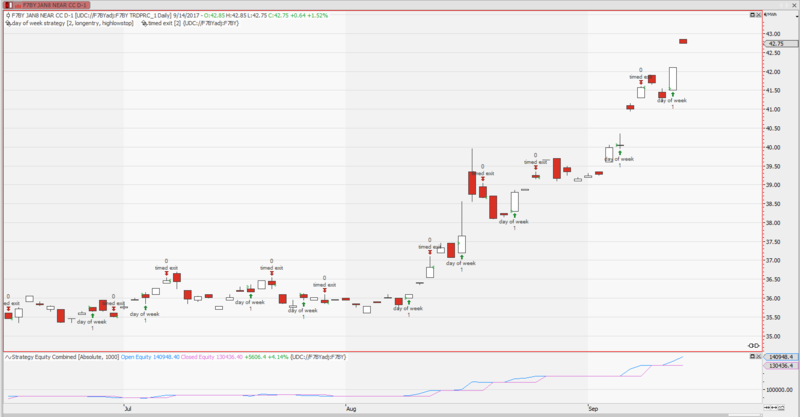 Only in the extreme, near 0 and 100, this indicator seems to implicate a bearish next day movement. 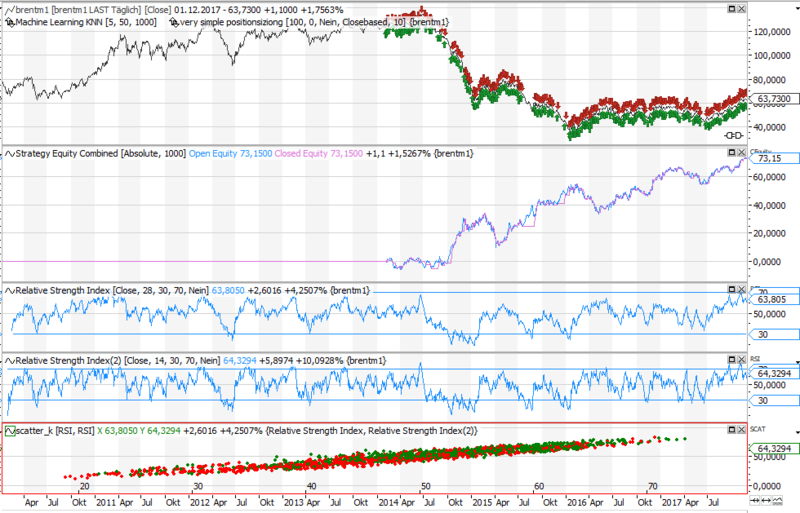 The right chart, showing the longer term prognosis of a long term stochastic seems to be more useful. 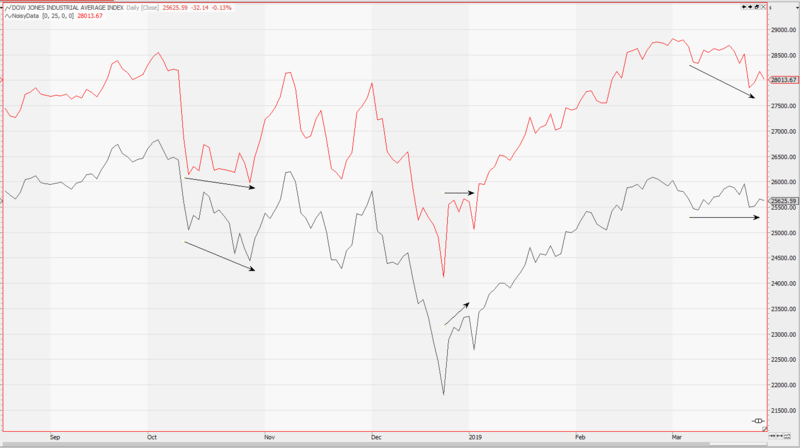 High levels of the indicator also show positive returns on the 5 days after, unfortunately you can not reverse the logic, as low indicator levels give a rater mixed prognosis. This visual analysis can give you an idea which areas of the indicator might be useful for further analysis. A one dimensional analysis like on the chart above could also be done without this scatter chart. Going from one dimension to two dimensions is more useful, as it directly can be translated to do a kNN machine learning trading strategy. 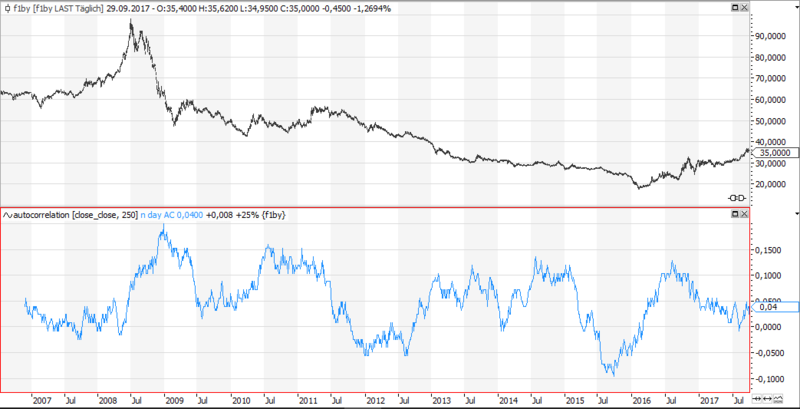 Have a look at the following chart. 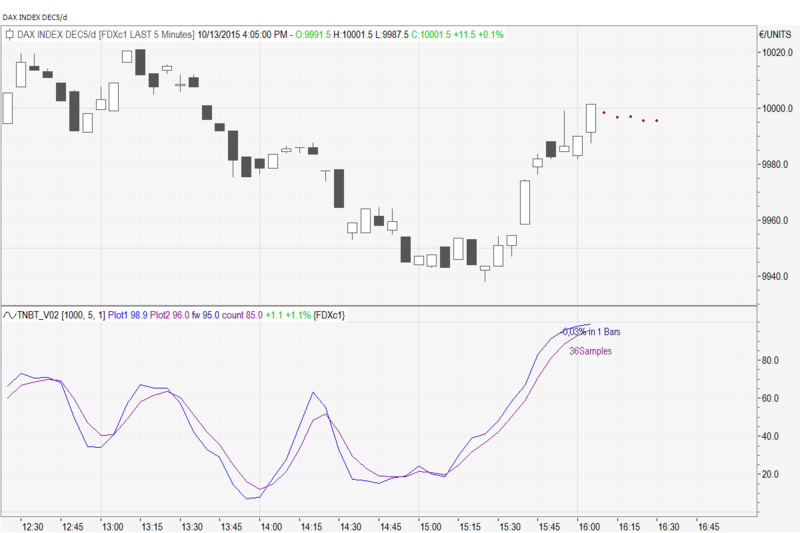 It shows the scatter of two indicators and the implication on the next days market move. Lets start with he right chart. As you can see the red and green dots are evenly distributed, meaning there is no useful correlation between the used indicators and the movement of the market on the day after. 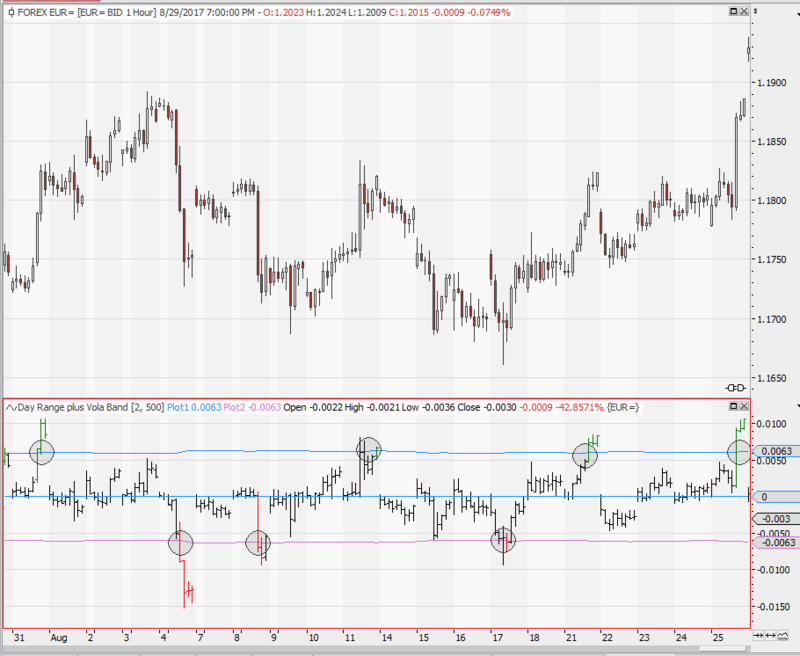 If you would use a kNN algorithm with these two indicators, I would bet it would not return great results. Even if you would get a positive return, it might just be a lucky hit or curve fitting. The opposite is true for the chart on the left. Here you can see some nice clustering of the red and green dots. Low indicator levels seem to predict a bearish move, high indicator levels result in a bullish move on the next day. A distribution like this is the perfect starting point for investing some time in a kNN machine learning trading strategy. The kNN algorithm would give you a strong prognosis with high or low indicator levels, and most probably only a weak or no prognosis when the indicators are around 50. The returns will be stable, no curve fitting problems should be expected. Using a scatter chart can give you a nice visual indication if your indicator might be useful for a prognosis of the next days market move. This is valuable insight, as you can see the whole data universe with one glimpse, even before you do a thoroughly statistical analysis. Numbers can deceive you, pictures usually tell the complete story. When ranking a market analysts usually pick the percent performance since a given date as their key figure. If a stock has been at 100 last year and trades at 150 today, percent performance would show you a 50% gain (A). If another stock would only give a 30% gain (B), most people now would draw the conclusion that stock A would have been the better investment. But does this reflect reality? In reality and as a trader I would never just buy and hold my position, I would always adjust my position size somehow related to the risk in it. I like instruments that rise smoothly, not the roller coaster ones which will only ruin my nerves. So ranking a market solely by percent performance is an useless statistic for me. Lets continue with our example from above: if stock A, the one who made 50% has had a 10% volatility, and stock B, the 30% gainer, only had a 5% volatility, I surely would like to see stock B on top of my ranking list, and not the high vola but also high gain stock A.
Risking the same amount of money would have given me a bigger win with stock B. Lets have a look at a sample chart to compare the 2 ranking methods. I therefore picked the J.P.Morgan stock. The upper indicator shows you a percent gain index. 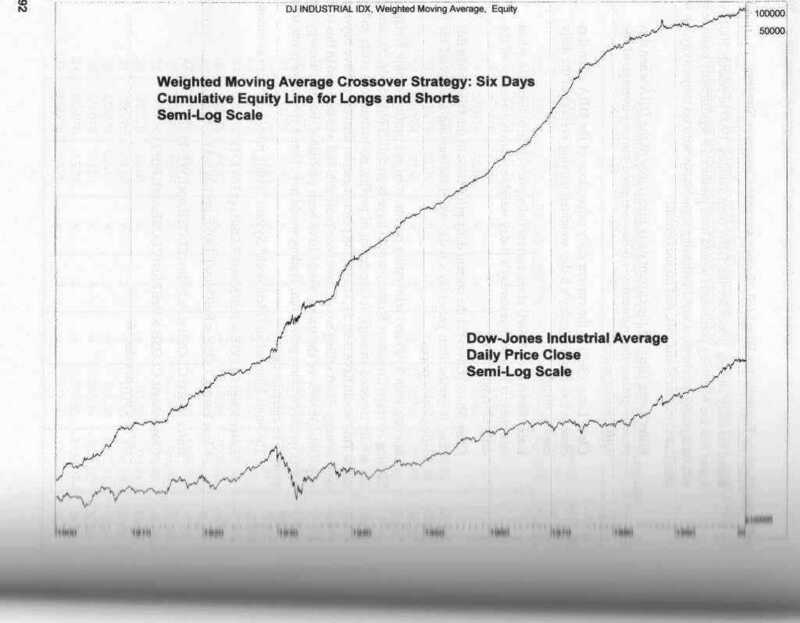 It sums up the daily percent gains of the stock movement, basically giving you an impression what you would have won when you would have kept your invested money constant. Have a closer look at the differences of these two indicators up to October 2016. JPM is slightly up, and that`s why the percent change index is also in the positive area. 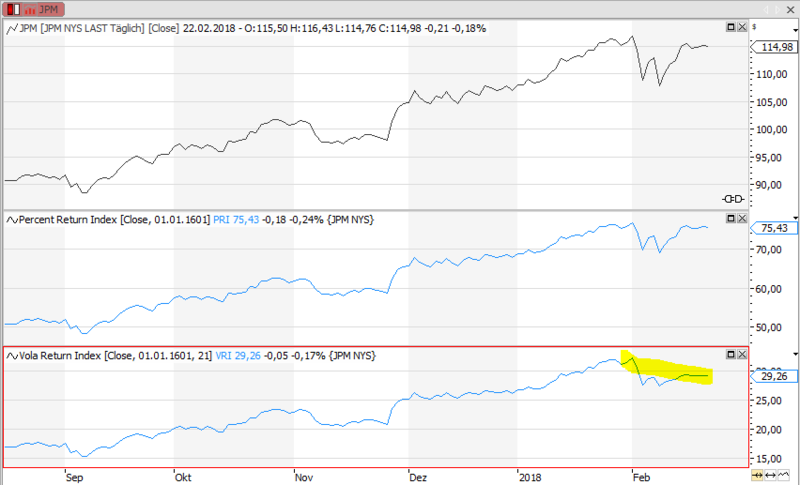 During the same time the Vola Return Index just fluctuates around the zero line, as the volatility of JPM picked up during this period of time. 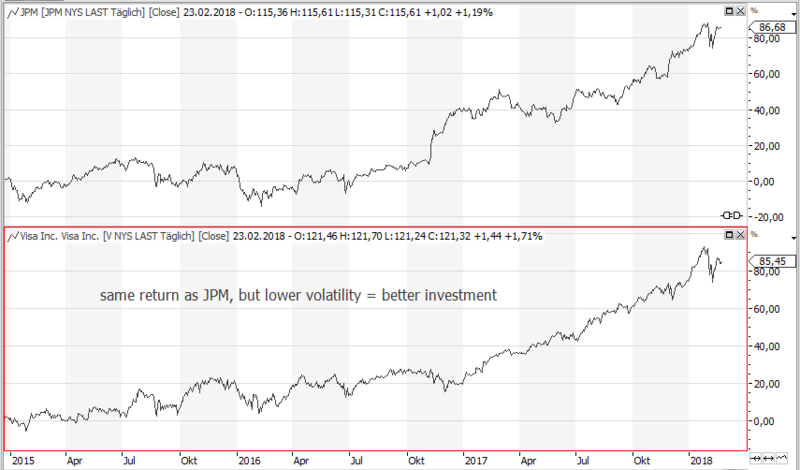 To keep your risk invested constant over this period of time you would have downsized your position when JPMs volatility picked up, usually during a draw down. No good. The same can be observed on the upper chart, showing the last months movements of the index. Right now, after the recent correction the percent change index is, like the JPM stock, up again. On the other side the Vola Return Index is still down, due to the rising volatility in JPM. 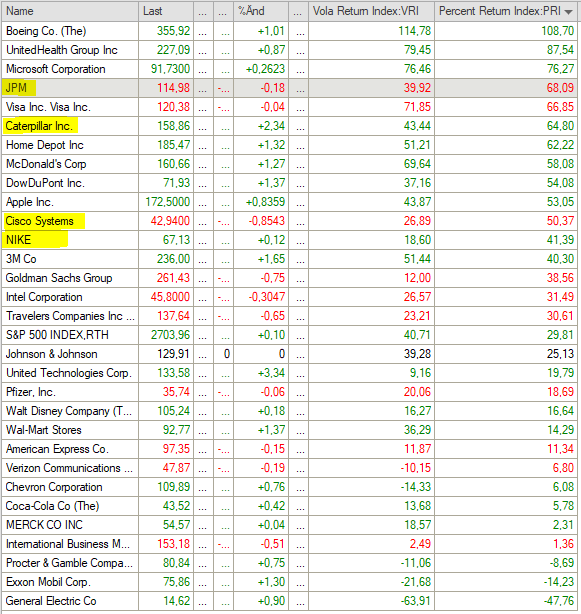 Lets put this to a test and rank the 30 Dow Jones industrial stocks according to the percent return index and using my Vola Return Index as a comparison, calculated since 01/01/2015. The first three stocks are the same, they got the highest vola and highest percent return. But JPM and Visa would get a different sorting. Just see how low the JPM Vola Index is, it would not be the 4th best stock. Make sure your indicators show what you actually can do on the market. There is no use in just showing the percent gains of a stock if you trade some kind of VAR adjusted trading style. 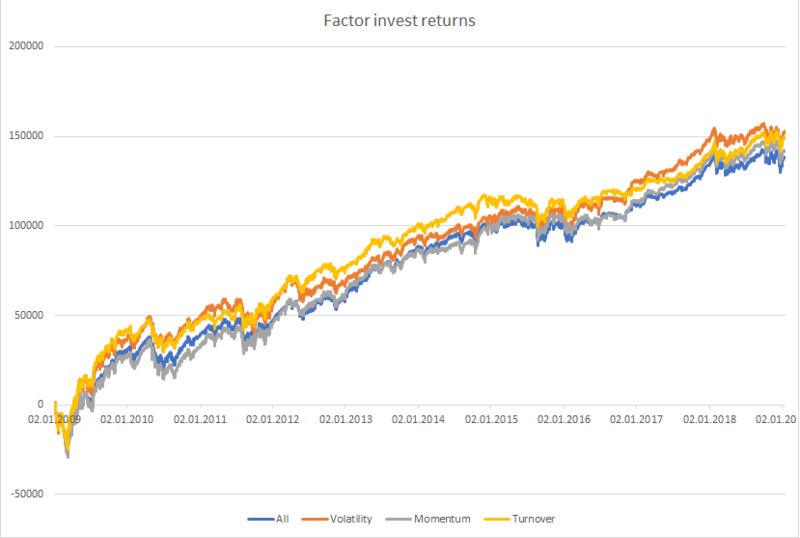 Keeping you risk under control is one of the most important things in trading, and using the Vola Return Index instead of just plotting the percent performance can give you some key insights and keep you away from bad investment vehicles. Also have a look at this stock picking portfolio based on similar ideas. Working on your position sizing algorithm is an easy way to pimp an existing trading strategy. 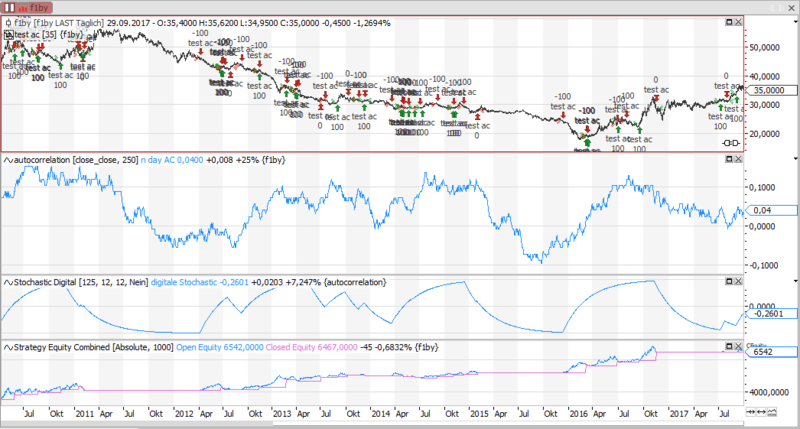 Today we have a look at an energy trading strategy and how the position sizing can influence the performance of the strategy. The screenshot shows you the returns of the same trading strategy, trading the same markets, the same time frames and using the same parameters. The returns on the left side look nice, making money every year. The returns on the right side are somehow shaky, and you would have to love volatility of returns if you would think about trading this basket. The only difference between the basket on the right and on the left side is the position sizing. The basket trades German power, base and peak (yearly, quarterly, monthly), coal, gas, emissions. 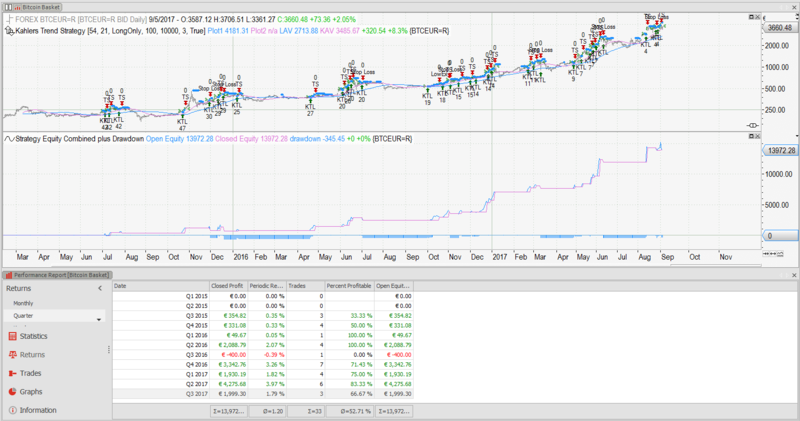 All instruments are traded on a daily and weekly time frame chart, using the same parameters. 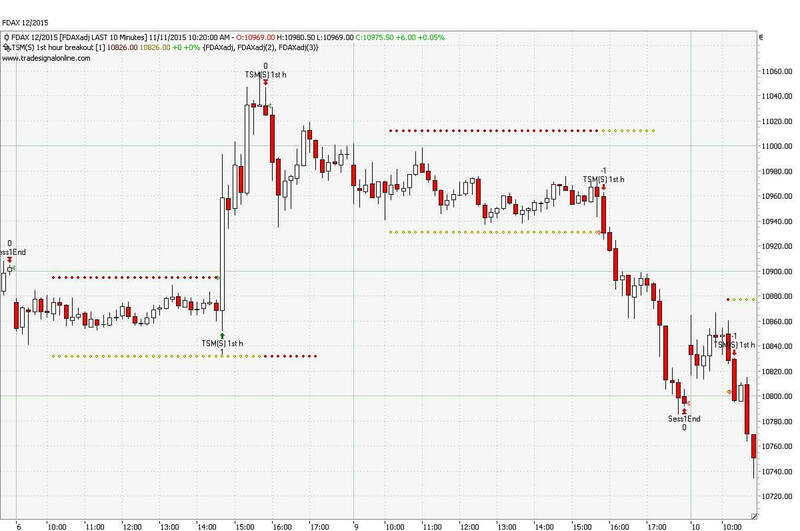 If the daily trading uses a 10-period parameter, the weekly trading would use a 10-week parameter. This limits the degrees of freedom I have when doing the strategy-time frame-parameter merge, thus minimizing the curve fitting trap.